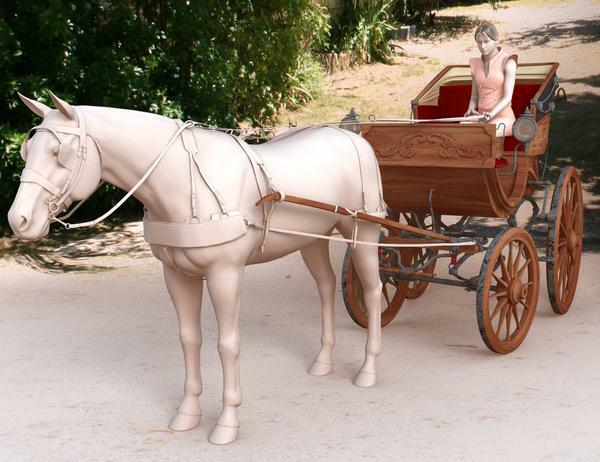 Well then a new horsey to play with...nice work Daz3D. 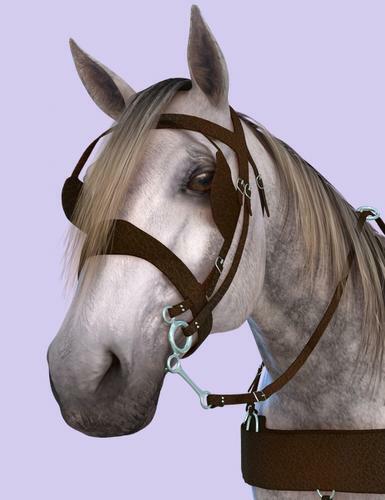 I am going to, wrongly or rightly, assume MIL house Uvmapping is not a part of this horse? First off it is "Jolly Hockey Sticks" or "Jolly good show". Don't drink and ride, you might spill some. Mary Poppins would never wear a bow tie and fez...Tommy Cooper did. We don't have wobbly bits, we have a stiff upper lips. I had to go a read it...too funny. Seriously, this really looks good and can't wait to see futureTri-Ax critters. A fully weight mapped cat, which could finally bend like the real thing, would be so cool. Llamas?! 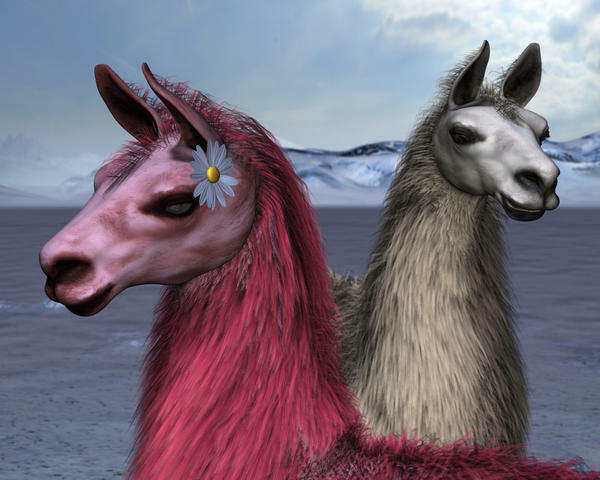 I was just looking for a llama model (or a vicuna or alpaca) earlier last week for an Andes scene. I tried mashing the hump of a poor camel model and shortening and straightening the neck, yanking on the ears, what a miserable thing that turned out! Delete! I was browsing my email half-alseep this afternoon and thought I was dreaming, LOL! But, it was Llamas! I went with the DAZ Horse 2 Starter Bundle because I waited too long for the western tack for the Mil horse to go on sale in earlier times. I thought because .cr2 was listed for the horse, accessories and llama I would be able to open the props or the horse cr2s in DAZ 4.0, but alas not able to. Clicking on the cr2 file opens DAZ without error but nothing appears in the Scene panel or workspace. One of these days when I read more positive comments I'll try 4.5. I just don't want to fight computer stuff, just want to play. I can't load the llama right now, but I have it and may be inspired. Once I got to hug a real live llama at a fair petting zoo. She had gorgeous sapphire blue eyes and long curly eyelashes, and her neck fur was so soft. She leaned into me and sniffed my hair. Llamas are lovely! This is as close to having one as I can get. The horse looks beautiful too. Nice artistry in these models in the renders I've seen so far. Thank you Daz and Daz PA's so much for this! Downloading lots of horse goodness now - excited to try this all out - hoping the missing pieces from the original posts will soon fall into place and be available for purchase! Especially looking forward to clothing for Genesis riders - wondering if there is any genesis western wear for cowboys and/or cowgirls coming our way? Would also like to join in on the request for medieval ordinary horse tack, and the hope that there might be fibre hair mane and tail for this beautiful model in the future. Will the CWRW Pro textures work with this horse? Somewhere somebody said they are updated? Does the Pro bundle really include only the Textures for the English and Western Saddle? Is there a possibility to get the extra morphs and textures of the Pro bundle without buying the extra stuff (especially when the extra stuff is only textures for not included items)??? I have a question - I was looking at the Wagon Trails - They look nice, but I am not seeing anything about any harness in either one. Does anyone know if a harness is included with either one or where one might be that could work? As usual I have an idea and am trying to get the kinks worked out before spending the bit of money I have. The Pro Bundle includes the Starter Bundle. So the Starter bundle has the saddles, and the Pro Bundle adds the extra textures. I did feel like I am missing something. Will MilHorse textures work on this horsey? Or is there a "morphs and textures package" that just has the morphs and textures in the starter and pro bundle? The 3 things I find most frustrating about DS (and could be from a lack of knowledge on my part) is what I see as shadow setting limitations/softer shadows (can't set the amt of shadow the way you can in Poser... again just maybe I can't find out how to do that) and lack of ability to set camera perspectives (wide angle vs more telephoto for example) the way you can in Poser. Also that a camera view doesn't "stick" when a file is closed and then re-opened. The Poser 9 interface is a huge let down to me anyway after P7 IMO. It lost so much interface elegance in particular, detrimentally impeding my workflow as well. From the sounds of it you are just using the perspective camera. The perspective camera may shift around when you close a file but If you create a camera then it won't move unless you do so yourself. Also if you create a camera you can change the camera setting from the default to wide angle and stuff. Sorry don't have a version of daz on this machine to show you where it all is. THe shadows questions is also one that you can change in DS too, but maybe someone else can explain that. I think I know what you are at, but not positive. The UVs have been updated so the MilHorse textures won't work on this horse, whilst I can see the value in the new uv maps I'm a bit cheesed off that that MilHorse UVs wern't included as V4 ones are for Genesis, I have hundreds of my own textures for the MilHorse, one of which I was working on the day before this release. 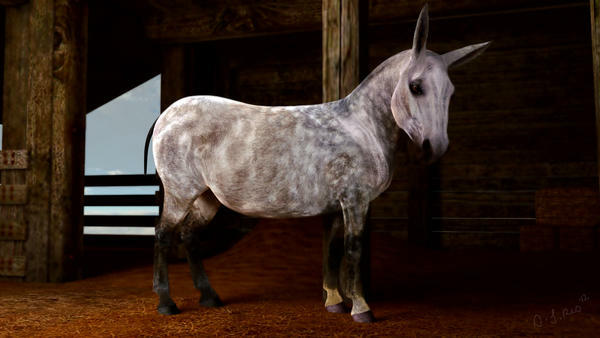 I'd pay for accurate MilHorse UVs for this horse to be able to use my own work. One other thing I just noticed is that the dials to change the leg length are missing in this horse? I think we need an update with some of these things adding in like the MilHorse SR2, the horse is very good but with a few more detail will be excellent. Re: Shadows: The only real control you have with the default DS lights is Shadow Softness (which is pretty much the rim/blend control). On Raytraced lights you're going to have to crank this pretty far up to really notice it. Keep in mind you'll need a pretty decent value for Shadow Samples on your Advanced Render tab if you want a LOT of softness on your primary (most intense) lighting... Say, 12 or 16 samples or more. If you switch to UberSpots, you'll have a few more controls such as Shadow Intensity and Shadow Color. These can also be created in Shader Mixer, but it's easy just to use the UberSpots IMO. (Plus you get Gel light functionality with UberSpots and per light shadow samples control.) I highly recommend anything by omnifreaker). The camera issues were answered above. Just start off with Create > New Camera and then make sure and use the pulldown on your viewport to select the Camera you create. Or if you're like me and you ALWAYS want a new camera setup, you can setup an empty scene with just the camera(s) you want and then set that scene as your startup scene. Thank you for the answer. I t is what I expected, so no worries. There is almost always some way around concept ideas. I love the look of the wagons and am waiting for payday to pick up the bundle. Thank you for all the lovely (from the promos) adds for the horse. Thanks for that. I thought I had a harness SOMEPLACE on my harddrive and that gives me a starting place even before I get the horse. Tweaking is better than creating from scratch, especially for someone who has yet to finish any digital sculpts. The Llamas are nice, too. Click the image to see it enlarged. The first thing I wanted to make was a donkey... :) Rendered in luxrender via reality plug in. Something like the Evolution Morphs? I wouldn't be a bit surprised to get something like that before too many months are past. Particularly if this is the first of a series of Genesis-based quadrupeds. O_o?! How is it that with the ASTONISHING flood of H2 products, there's no geografted unicorn horn...? Wings and horn is in the works, I hear. What about centaurs made from H2 and Genesis? Is that getting any love yet? I've not read the full thread. Is why I asked. Also it would be interesting if they had a cat and "rodent" that used the same mesh, but my guess is they would do different ones. At least from what I have read there doesn't seem like the horse at least was designed to become a chimera of any sort, so I doubt the cat or dog would. So I say skip the dog and cat all together and make a manticore. The new hair products will probably bring enough life into the old cat and dog for a lot of users that want those types of products and not fantasy creations. EDIT: but if the horse sells well enough who knows what the would do, I'm just having a hard time seeing them have a $40 cat or dog in the store. More so for a rodent. Oh, say it isn't so.=-) Would love Genesis cat and dog, especially if they make a small dog. I so want a chihuahua! Oh, WOW! Did we just release MORE Horse stuff? Check out the new: Jockey Set! Racing not your style? Perhaps you need to belt out Tallyho! While drinking tea with the Duchess of North Hamptonshirefordillton. You can only have your chi dog if they make my MinPin morphs first. I must have that one. And a german shepard too. I'd buy just about any dog morph that isn't a small fluffy white dog. Cool more horse stuff. Looks fun. I'm god with a mini pin, chi, and german shep. The german shep would be great for using my languishing police set. Oh foo. I just made an order to get something in FastGrab. I should have waited another hour. The textures and boots on the riding habit are very well done! If we encourage midnight_stories, we just might get it sooner than later.